After a run of three years at RSPB Minsmere, it’s the last week of the last Springwatch at the reserve and I’ve had a chance, with some of my colleagues at the RSPB, to visit the set and find out some more about how the phenomenon, which is Springwatch is made. 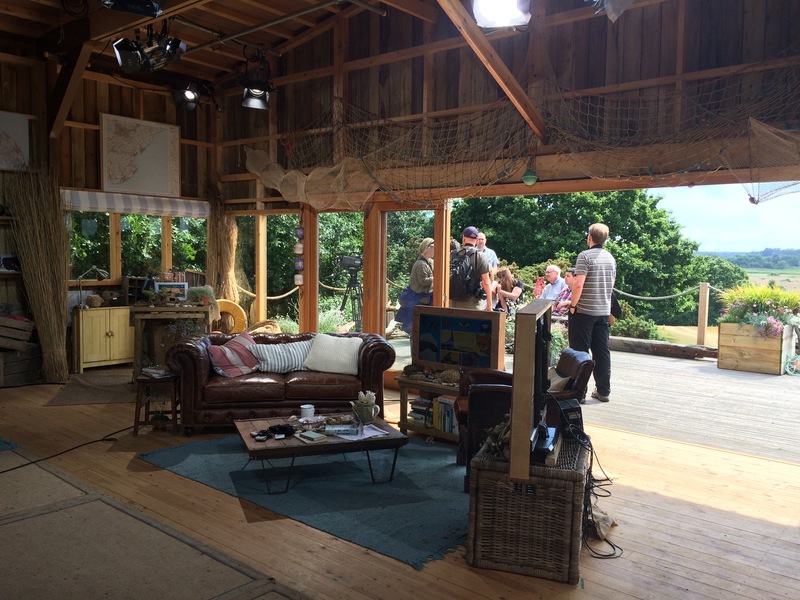 To Springwatch’s millions of devoted fans it may seem like a relaxed and casual event, kicking back in those chesterfield sofas, but Springwatch is anything but. The presenters may exude the calm of the proverbial swan, gliding along on the surface, but beneath the water, a massive and well-oiled and expert machine is frantically paddling away. There’s a village of people on site at RSPB Minsmere, 120 people decamp to the site for the three weeks of transmission, and take up most of the local accommodation. Four massive trucks housing the outside broadcast equipment jostle for space with tents, marquees, truck diners and gazebos. 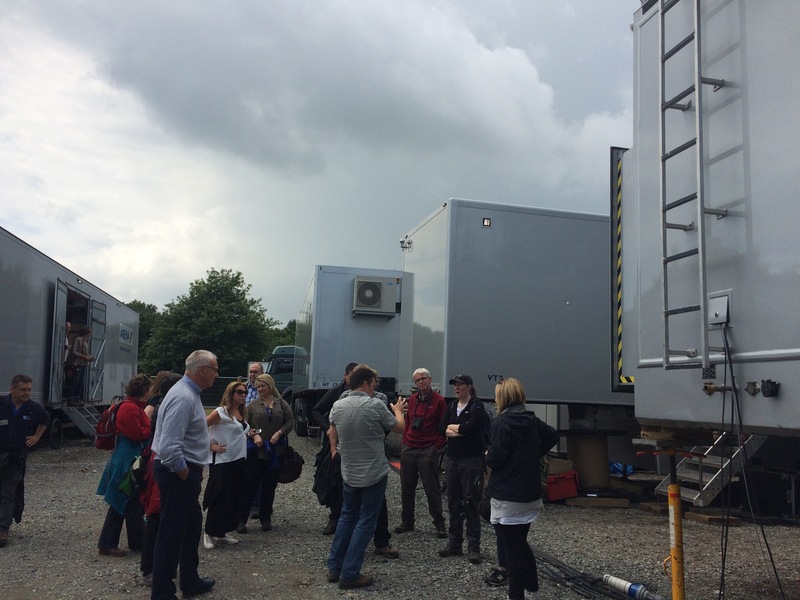 “It costs me a million pounds to rent those outside transmission trucks for the month of Springwatch” says Tim Scoones, executive producer, and the man behind the show, who is showing us around the site. Before us is a bank of screens pulsating with action: nests and eggs and, of course spineless Si (and Stephen Fry). It’s like a control centre for …. well ….like a control center for the biggest outside live broadcast the BBC does. “Springwatch is different from all those other shows” says Tim, explaining the ambitions and the sheer brass neck of Springwatch. 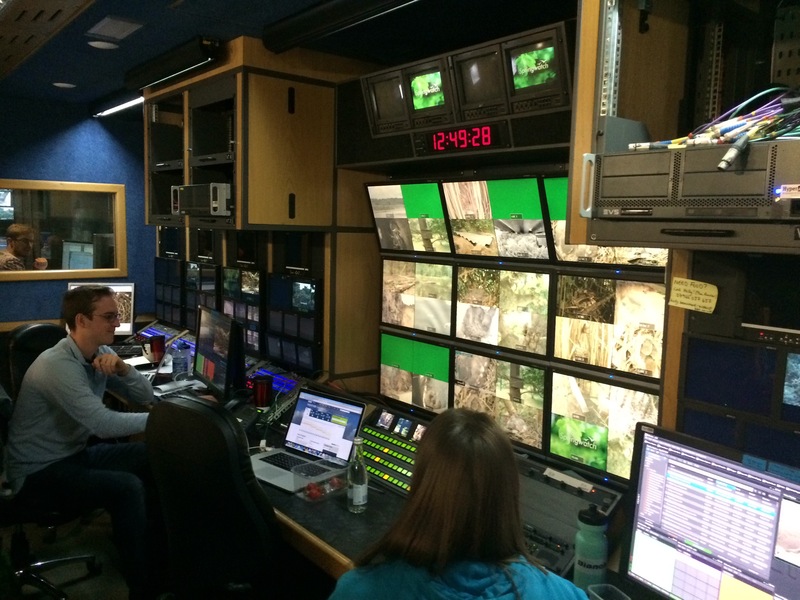 “There are thirty live feeds coming into the main truck, with six at any one time recording”. Tim has story developers watching those screens intently 24 hours a day, ready to catch anything exciting, new or unusual. “we take our inspiration from Big Brother and from the news. These guys are making the stories as they happen”. I ask what happens if they can’t switch one of the live cameras to record in time. “We have to be ready all the time” says one of the story developers. “If we don’t we can miss something spectacular”. They give an example from the previous day where they had an adder predating on one nest box and, at the same time, a stoat coming into another. They simply couldn’t get to the record buttons in time. There’s a live broadcast about to start “we like to think of it as Test Match Special meets rolling news” jokes Tim as he ushers us out of the truck to continue the chat. Tim explains more about quite how innovative and seat-of-the-pants Springwatch is. 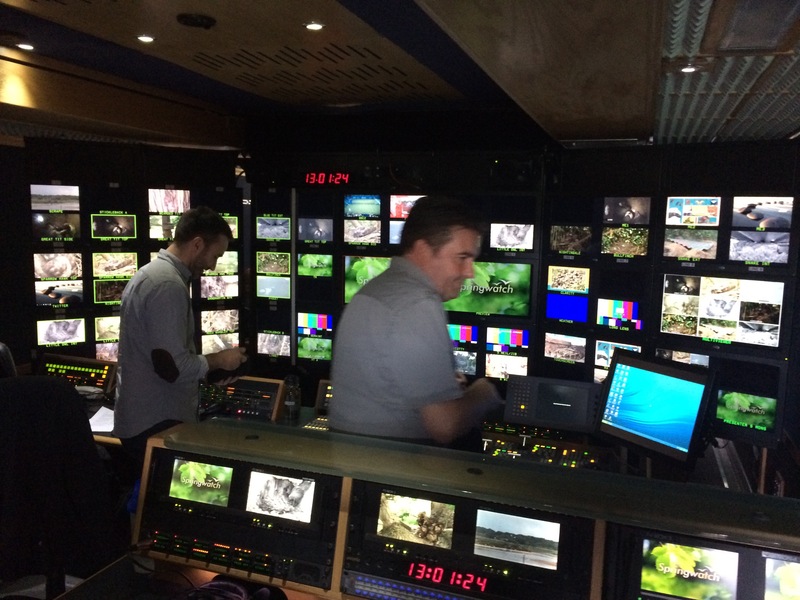 “There’s no autocue” he says, “This is what makes springwatch different. There’s no script, we are remaking the show as it goes out”. The presenters have a cacophony of voices going on in their ear-pieces as they speak; someone telling them countdowns to items cutting in or out, another person telling them what item is next, or that they need to cut straight to a hatching, or some other exciting happening on one of the cameras “When something happens live like that nightingale singing last night, we just cut straight to the camera and the presenters just have to carry on”. They are constantly changing items, cutting items and lengthening items as the show goes out. It’s a wonder that Michaela, Chris and Martin sound as relaxed and unruffled as they do with all that happening around them. Suddenly a producer appears at the door of the truck. “Breaking news!” he says “those sparrowhawk eggs are hatching”. He pops back into the truck only to appear seconds later with more breaking news. 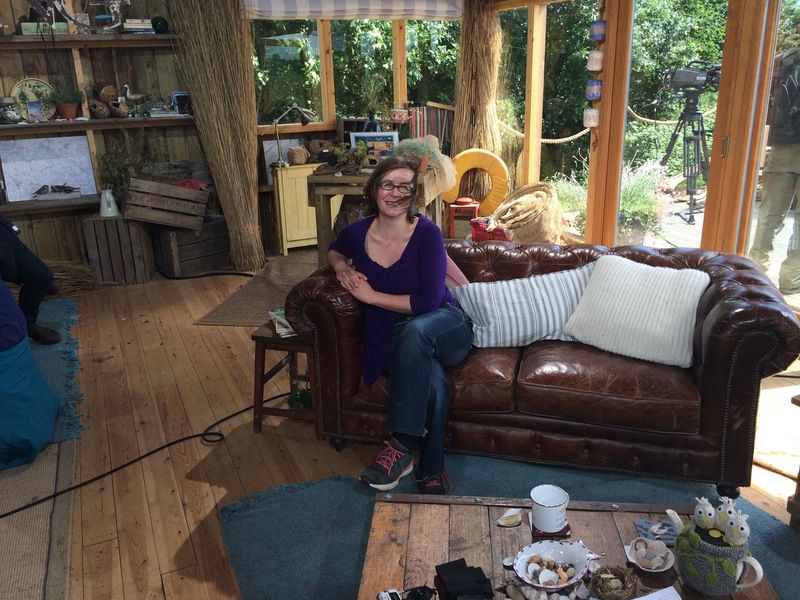 There is simply never a dull moment on the set of Springwatch. Later that day we get a chance to see Chris Packham in action. We are part of the audience in Unsprung, standing rather self-consciously around the set trying to ignore the cameras getting thrust right into our faces and hoping that a close up of our faces won’t make it into live TV. The show is funny, slick, and a bit tongue in cheek. 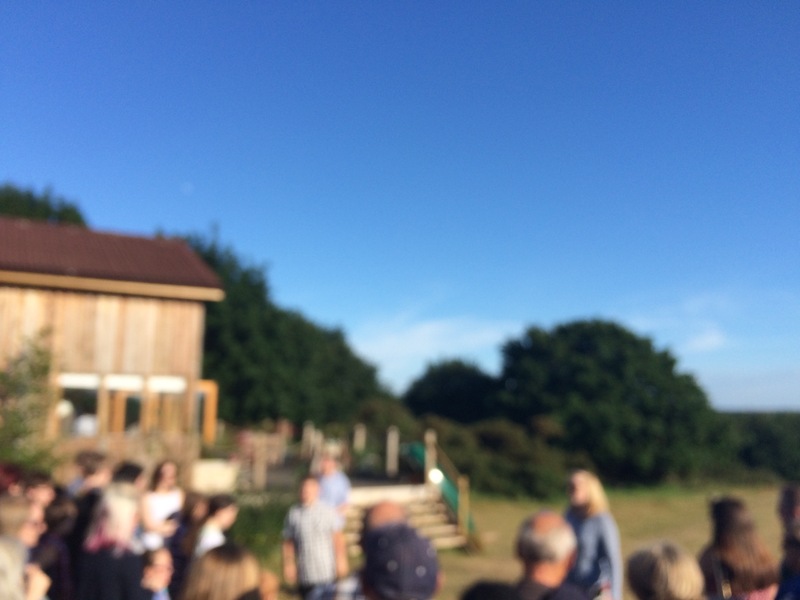 We clap, we cheer, we groan at the rubbish jokes, we boo (when Chris Packham criticizes a fantastic photo of a swimming adder), and before we know it we are shuffling off-set and back into the evening sun of RSPB Minsmere. 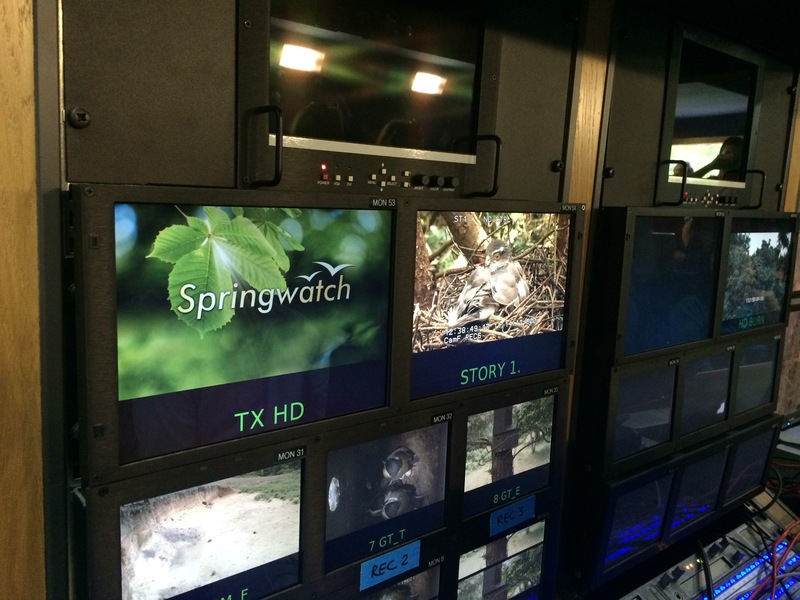 We leave awestruck by the energy, the devotion, the skills and the teamwork of everyone working on Springwatch. 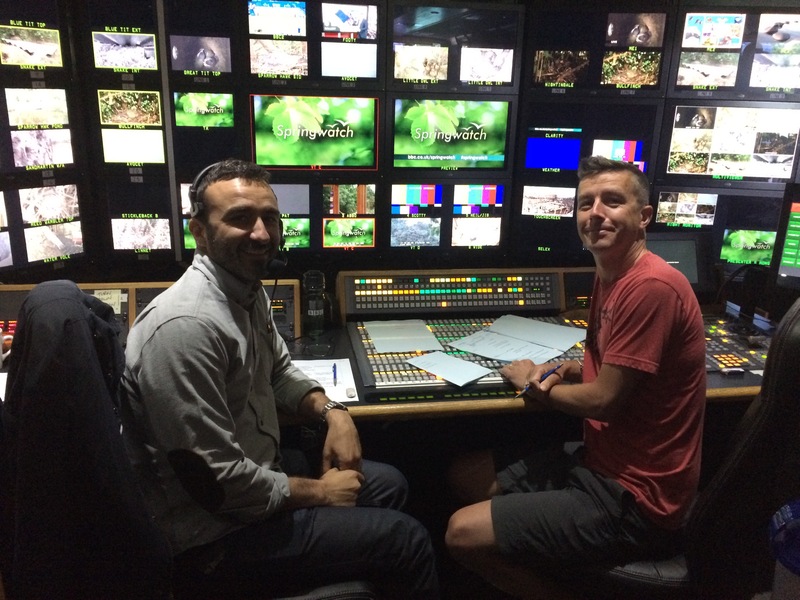 Our day may be over but Chris, Martin, Michaela and the whole oiled machine of BBC staff still has a run though of the show and Springwatch itself to go before they finish up for the day. I’ll certainly be watching Springwatch with new eyes, and a large helping of awe and admiration when it goes out from RSPB Minsmere for the last time later this week. This entry was posted in blog, Miscellaneous, Uncategorized, Work and tagged RSPB Minsmere, springwatch by nager. Bookmark the permalink.